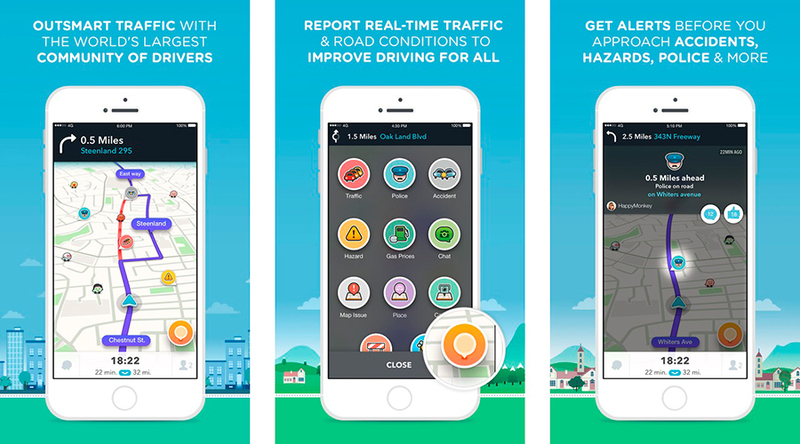 The maps and traffic app Waze, acquired by Google in 2013, announced on Monday that a new version of the app was released in the Apple Store, with Android coming soon. One of the changes in the app is the design, now cleaner and elegant, that offers quick access and easier navigation, reporting and sharing for its users. The company redesigned the app to make it simpler for users, as they use it while driving. Now, with fewer taps to the screen, you will be able to get access to all features. Just by tapping the left button, the navigation menu will appear, showing also your favorite destinations. Tapping the right button sends you to your contacts, allowing you to send directions, give them your location, and ETA (Estimate Time of Arrival) to those who are waiting for you. If you are running late, you can view alternate routes to your destiny, and let people know you are coming on the way using the center button where your ETA is displayed. Also, Waze will let you know when it’s the best time to get on the road, as it syncs your calendar with the traffic report, by adding a street address to your event location. The last feature announced by the company was the reduce of battery consumption, so it will not drain while you are on the road and using the app. This update expects to keep integrating Waze and Google, as the navigation app provides real-time incident reports on Google Maps, a feature already present in previous versions.